Anaphylactic shock is a severe allergic reaction that can result in death without immediate access to medication and medical assistance. Anaphylaxis often has a rapid onset, with symptoms following each other in a rapid succession. Very rarely, anaphylaxis is a delayed allergic response to exposure to an allergen. Symptoms of anaphylactic shock begin with a skin rash, itchiness, swelling of the eyes, tongue and throat and continue with breathing difficulties, hypotension and loss of consciousness. Primary treatment for anaphylaxis is administering adrenaline, usually followed by administering fluids and careful monitoring. What is anaphylactic shock? Anaphylactic shock, or anaphylaxis, is a form of severe allergic reaction following exposure to an allergen. Virtually any allergen can be a trigger for anaphylaxis. Food, medicines, clothing material, metals, pollen, molds and other harmless elements can have allergenic potential. Anaphylaxis symptoms affect multiple systems and organs: skin, respiratory system, cardiovascular system and nervous system. How does anaphylactic shock occur? Anaphylaxis is an immune system reaction. People with allergies have an oversensitive immune system that tends to work harder to protect them. This means their immune system activates even in the presence of elements that don’t cause disease. These elements are allergens. But the immune system is so overactive that it sets in motion a complex sequence of reactions meant to eliminate the allergen it considers dangerous for the body. More exactly, the immune system activates itself and produces antibodies in response to the allergens. These antibodies activate mast cells and basophils, two types of white blood cells that contain histamine and other inflammatory elements. Mast cells and basophils degranulate which results in them releasing the histamine and other inflammatory components. When it’s released in the body, histamine causes inflammation that translates into inflammation of the eyes, nose mucous membrane, swelling of the tongue, throat, skin symptoms etc. The immune system is so strong sometimes that it causes too much inflammation which can obstruct breathing and lead to loss of consciousness, cardiovascular events and possibly death. This is what makes anaphylactic shock life-threatening. How long does it take for anaphylaxis to set in? Typically, anaphylaxis symptoms start shortly after the exposure to an allergen. It is estimated that it takes as little as 5 minutes for anaphylaxis to set in or as long as 2 hours. Immediate access to life-saving medication (adrenaline) and medical assistance is vital. 1) Insects stings: ants, wasps and especially bee stings. 2) Medication: antibiotics, in particular penicillin can cause anaphylactic shock. Others include: some anesthetics, anti-inflammatory and pain-relieving medication, vaccines. 3) Pollen: severe pollen allergies cause anaphylactic shock (see grass allergy, parietaria allergy). 4) Latex and other biological elements. 5) Food additives: food coloring, sulfur dioxide preservatives, monosodium glutamate etc. 6) Foods themselves: peanuts, shellfish, eggs etc. 7) Irritant chemicals in cleaning products, skin care products, products for topical use etc. What are the risk factors that cause an anaphylaxis reaction? The main risk factor for anaphylactic shock is exposure to allergens, irrespective of the type of allergen. Other risk factors that can encourage anaphylaxis include existent conditions, notably seasonal (pollen) allergies, asthma, atopic dermatitis or eczema. 1) Shellfish: molluscs (mussels, oysters, clams, scallops) and crustasceans (shrimp, lobster, crab). 2) Nuts: pecans, cashews, almonds, pine nuts, walnuts, Brazil nuts etc. 3) Peanut allergy is one of the most common forms that can cause anaphylaxis. 4) Lupine, common in those with peanut allergy. 5) Sesame seeds, all colors. 6) Nightshades: tomatoes, eggplants etc. 7) More common: dairy and milk, eggs, fish, celery. 1) Skin. Symptoms affecting the skin include hives with itching, redness and swelling. Some people experience a strong burning sensation. If anaphylaxis progresses, the lack of oxygen due to airways closing causes skin to become purple. 2) Respiratory system. Wheezing, coughing, not being able to breathe in air or take a deep breath, swelling of the tongue and throat, difficulty and pain swallowing and closing of the airways are symptoms of anaphylaxis. 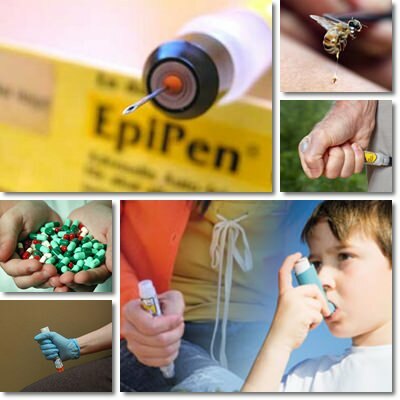 Chest tightness, throat tightness and asthma attacks are common too as anaphylaxis progresses. 3) Cardiovascular system. During an anaphylactic shock, the release of inflammatory elements such as histamine can cause coronary artery spams that prevent blood flow to the heart and may result in a heart attack. Blood pressure may drop, tachycardia (fast heart rate) installs and dizziness and loss of consciousness may occur. 4) Gastrointestinal tract. Gastrointestinal symptoms of anaphylaxis may include diarrhea, nausea, vomiting, loss of bladder control and abdominal cramps. 5) Nervous system. Oxygen deprivation along with the rapid onset of symptoms can lead to headaches, lightheadedness, dizziness and loss of consciousness. Anxiety or feelings of panic may set in. 1) Skin allergy test. The skin is pricked, scraped or scratched lightly and one or multiple allergens are applied to see if the skin reacts to them. Redness, swelling, itching indicate an allergy. 2) RAST blood test. It looks for antibodies to allergens. 3) Skin patch test. Suspected allergens are applied to the skin using a patch to elicit a skin allergic response. What to do if you have an anaphylactic shock? Anaphylaxis is a medical emergency and as a result, access to medication and medical care is life-saving. If you have known allergies and conditions that increase your risk of anaphylactic shock, it is important to always have your medication with you. Typically, for those with known severe allergic reactions, an epinephrine auto-injector called an EpiPen may be prescribed. It contains epinephrine (adrenaline) to be used in the event of anaphylaxis by injection in the thigh muscle. Your doctor knows best to advise you when and how to use an EpiPen. Sometimes, two doses of epinephrine may be required, which is why it is important to seek medical assistance immediately. Bracelets that indicate special medical conditions such as severe allergies might be useful in helping others determine if you need medical help. Even if you are recovering after the EpiPen, you need to be put under medical supervision for 24-72 hours in case a secondary, delayed anaphylactic shock occurs. Doctors will most likely administer fluids and other anti-inflammatory medication like corticosteroids to help you breathe better and reduce inflammation. In any case, it is crucial to avoid known allergens in all their forms.